Ensaf Haidar, wife of blogger Raif Badawi, takes part in a rally for his freedom in Montreal on January 13, 2015. The Saudi Arabian government plans to withdraw all Saudi students it has been sponsoring at Canadian universities, colleges and other schools in retaliation for Canada criticizing the Islamic kingdom’s human-rights record. The news emerged on the same day that Saudi Arabian Airlines announced it would suspend all flights to and from Toronto as of Aug. 13. A Saudi government source, who wasn’t authorized to speak publicly on the matter, said on Monday more than 15,000 Saudis study in Canada on scholarships, grants or in trainee programs funded by Riyadh. Accompanying family members bring the number to 20,000 or more. The Saudi students – and their tuition – will be placed in study programs in other countries with similar education systems, such as the United Kingdom or the United States, the Saudi official said. The Saudi kingdom is angry at statements on Twitter from Foreign Affairs Minister Chrystia Freeland and her department last week. 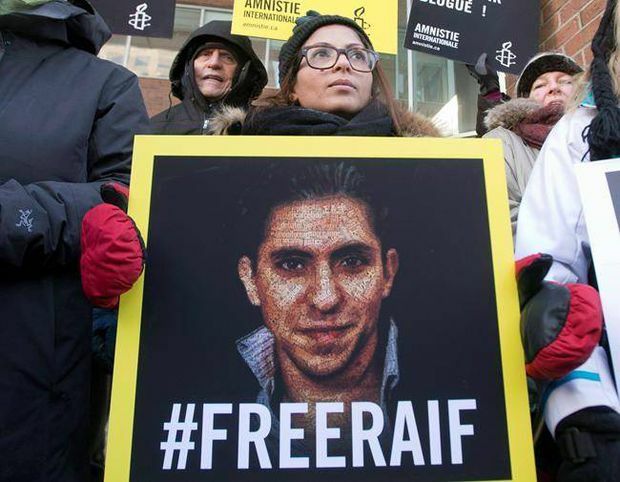 Canada called for the immediate release of civil-rights activists in the country and signalled concern over a new crackdown on dissidents by Riyadh. These included Samar Badawi, the sister of imprisoned Saudi writer Raif Badawi, in jail for insulting Islam. Mr. Badawi’s wife, Ensaf Haidar, who lives in Quebec with their three children, recently obtained Canadian citizenship. The full economic impact of losing Saudi students is not immediately measurable. It appears Canada would lose hundreds of millions of dollars – possibly more. Tuition and living expenses for foreign students vary by province and education program. A full-time Saudi student without Canadian citizenship attending a major school such as the University of British Columbia or University of Toronto would pay $30,000 to $80,000 for tuition and living expenses, depending on their area of study and whether they live on campus. Speaking for the first time on this row, Ms. Freeland was unapologetic and noted the government’s recent remarks on Saudi Arabia were consistent with what the Liberals have said publicly for some time. “There is nothing new or novel about Canada’s support for human rights, very much including women’s rights, around the world and including in Saudi Arabia,” she told reporters in Vancouver on Monday. Ms. Freeland emphasized on Monday that Canada retains a diplomatic presence in Riyadh. “I want to assure Canadians our embassy is still in place in Saudi Arabia,” she said. She also said Canada stands by its comments on human rights in Saudi Arabia. On Monday, Ms. Haidar called the situation extremely delicate and said she could not comment further. Ms. Freeland said the Saudi decision on education would be “a shame for those students if they are deprived of the opportunity to study” in Canada. "Saudi students who have been accepted to Canada are very much welcome to arrive as planned and study here,” she said. Meanwhile, Amnesty International says the global community should form a united front with Canada and speak out to protect Ms. Badawi and another woman recently arrested. Canada and Saudi Arabia are not major trading partners, but two-way merchandise trade exceeded $4-billion last year, a significant portion of it from the combat vehicle deal. Saudi watchers suggest the new Crown Prince, Mohammed bin Salman, is using Canada to send a strong signal to Western governments to scale back criticism of his country. Saudi Arabia regularly ranks among the “worst of the worst” on human-rights ratings put out by U.S. watchdog Freedom House. “The main purpose for Saudi Arabia here is not to penalize Canada per se. ... This is a message to Western countries: stop criticizing us on human rights or else we will retaliate,” Mr. Juneau said. Bessma Momani, a political science professor at the University of Waterloo, said she thinks the Saudi backlash “was very calculated” and that Riyadh chose the Canadian government under the progressive leadership of Prime Minister Justin Trudeau to make a point.